Next morning, the field mice found their little boy, asleep in the snow, warm and snug beneath the furry carcass of a dead bunny. Their relief and excitement was so great that they didn't even think to question where the bunny had come from. Barrington was not really a very handsome bunny. He was brown and speckled and his ears didn't stand up right. But he could hop, and he was, as I have said, very furry. "Bunnies," he thought to himself, "can hop. And they are very warm, too, because of how furry they are." "Hello, up there," called Barrington. "Hello, down there," came the reply. "Having a Christmas party?" asked Barrington. "Oh, yes!" answered the squirrels. "It's Christmas Eve. Everybody is having a Christmas party!" "May I come to your party?" said Barrington softly. "Well, how can you come to the party if you're a bunny? Bunnies can't climb trees." "That's true," said Barrington thoughtfully. 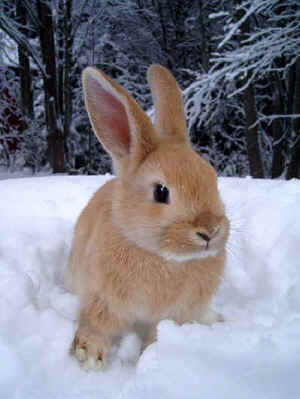 "But I can hop and I'm very furry and warm." "We're sorry," called the squirrels. "We don't know anything about hopping and being furry, but we do know that in order to come to our house you have to be able to climb trees." "Oh, well," said Barrington. "Merry Christmas." "Merry Christmas," chattered the squirrels. "It's the beavers," thought Barrington. "Maybe they will let me come to their party." "Who's out there?" called a voice. "Hello, Barrington," said the beaver. "May I come to your Christmas party?" asked Barrington. The beaver thought for awhile and then he said, "I suppose so. Do you know how to swim?" "No," said Barrington, "but I can hop and I am very furry and warm." "Sorry," said the beaver. "I don't know anything about hopping and being furry, but I do know that in order to come to our house you have to be able to swim." "Oh, well," Barrington muttered, his eyes filling with tears. "I suppose that's true-Merry Christmas." "Merry Christmas," called the beaver. And he disappeared beneath the surface of the water. "It's a party," thought Barrington. And suddenly he blurted out through his tears, "Hello, field mice. This is Barrington Bunny. May I come to your party?" "Bunnies," he thought, aren't any good to anyone. What good is it to be furry and to be able to hop if you don't have any family on Christmas Eve?" Barrington cried and cried. When he stopped crying he began to bite on his bunny's foot, but he did not move from where he was sitting in the snow. For a long time the silver wolf didn't say anything at all. He just stood there and looked at Barrington with those terrible eyes. Then slowly and deliberately the wolf spoke. "Barrington," he asked in a gentle voice, "why are you sitting in the snow?" "Because it's Christmas Eve," said Barrington, "and I don't have any family, and bunnies aren't any good to anyone." "Bunnies are, too, good," said the wolf. "Bunnies can hop and they are very warm." "What good is that?" Barrington sniffed. "It is very good indeed," the wolf went on, "because it is a gift that bunnies are given, a free gift with no strings attached. And every gift that is given to anyone is given for a reason. Someday you will see why it is good to hop and to be warm and furry." "But it's Christmas," moaned Barrington, "and I'm all alone. I don't have any family at all." "Of course you do," replied the great silver wolf. "All of the animals in the forest are your family." And then the wolf disappeared. He simply wasn't there. Barrington had only blinked his eyes, and when he looked-the wolf was gone. "All of the animals in the forest are my family," thought Barrington. "It's good to be a bunny. Bunnies can hop. That's a gift." And then he said it again. "A gift. A free gift." Then hop. Hop. Hippity-hop. To beaver's house. He left the stick just outside the door. With a note on it that read: "Here is a good stick for your house. It is a gift. A free gift. No strings attached. Signed, a member of your family." "It is a good thing that I can hop, he thought, "because the snow is very deep." Then Barrington dug and dug. Soon he had gathered together enough dead leaves and grass to make the squirrels' nest warmer. Hop. Hop. Hippity-hop. He laid the grass and leaves just under the large oak tree and attached this message: "A gift. A free gift. From a member of your family." Soon poor Barrington was lost. The wind howled furiously, and it was very, very cold. "It certainly is cold," he said out loud. "It's a good thing I'm so furry. But if I don't find my way home pretty soon I might freeze!" "Hello, little mouse," Barrington called. "Don't cry. I'll be right there." Hippity-hop, and Barrington was beside the tiny mouse. "I'm lost," sobbed the little fellow. "I'll never find my way home, and I know I'm going to freeze." "You won't freeze," said Barrington. "I'm a bunny and bunnies are very furry and warm. You stay right where you are and I'll cover you up." Barrington had only two thoughts that long, cold night. First he thought, "It's good to be a bunny. Bunnies are very furry and warm." And then, when he felt the heart of the tiny mouse beating regularly, he thought, "All the animals in the forest are my family." After the field mice had left, Barrington's frozen body simply lay in the snow. There was no sound except that of the howling wind. And no one anywhere in the forest noticed the great silver wolf who came to stand beside that brown, lop-eared carcass.